I love cleaning out my PC. When I can reimage and start from scratch I am a happy man. Why? Everything runs smoother. It is, in many ways, the same as getting your car washed and detailed. It is a known fact that cleaner cars run better than dirty ones. In reality, as we use our computer the OS can, over time, get kludgy. I could go into the reasons for this, registry bloat and infestation and all that, but this is not an article for the 300-level types who need to know these things, it is for the average man or woman – the one who knows that his or her computer ran faster when they got it than it does today. When I say this is not for the 300-level types, it is because at that level there are both more roadblocks to this, as well as better tools to accomplish the end goal. We’ll talk about the Microsoft Deployment Toolkit, User State Migration Tool, and other fun stuff in other articles. This, my friends, is an article for my mother-in-law… an end user who does not tend to install applications on a regular basis, who uses the same Microsoft Office Home and Student, maybe a game or two, and the Internet. Windows 7 has a great tool in it called Windows Easy Transfer. In short, it captures your user profile to an external device, and restores it to your newly installed PC. It is great for when you get a new PC, or when your PC needs to be re-imaged. Before I begin any repair work to the PCs of friends or family I begin by taking a quick WET image. It doesn’t save your applications, but those can be reinstalled. Lost data, on the other hand, can be quite costly both in terms of financial and emotional expense. 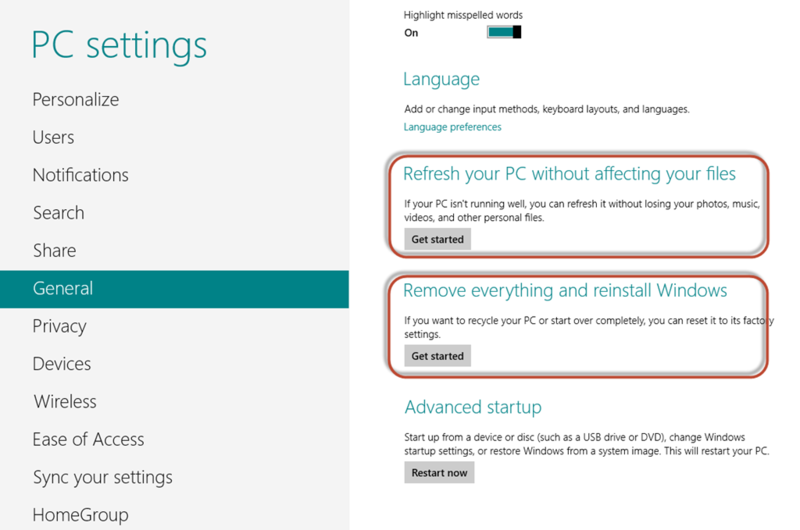 Windows 8 has two new tools on the General tab of the PC Settings screen that are really exciting. Refresh your PC without affecting your files. Although Windows 8 promises real improvement in the kludginess factor (it is, as I have stated in recent articles, really really fast!) I am sure that there are things that will affect your PC that will cause it to slow down over time. Whether that be malware, errant code, or anything else that may affect the speed and performance of your PC. the Refresh Your PC option will literally clean out everything… except your data. It will restore all of your settings, it will wipe out all applications, and then restore all applications that were installed from the Windows Store. This is a long-thinking view, because right now most of our applications are installed from media, but the plan is that this will (over the course of several years) change to most apps being installed from the Store, just like apps for the iPhone and iPad are from the iStore. While neither of these are features that anyone will be using every day, they will make restores and clean wipes much easier than they ever were. Just be careful not to press either of these by accident… although there are fail-safes in place (notice the big CANCEL option!) it is just as easy to press the wrong button and end up wiping the lot. While it will not prevent it from happening, I strongly suggest a good backup strategy, and of course storing your data in the cloud never hurts – the new SkyDrive app will make that much easier for end users and IT Pros alike.